If you have read a few articles on TourMyCountry.com, you have probably realised by now that I am neither a big fan of historicism (of any other aspect of late 19th century mainstream culture), nor of Vienna. The Gründerzeit, the period between approximately 1850 and 1900, has left its marks most notably in the Ringstraße - in a style that is now associated with this road, with Vienna, even with all of Austria. A concentration of the mainstream Gründerzeit culture can be seen in the Stadtpark: A patch of green land with nice, old trees that look rather pleasant in principle (ignoring the druggies, the thousands of tourists and the tacky memorials mostly for operetta composers): Old trees, artificial creeks and ponds, little fountains and nicely arranged flower beds. Alas, on two of the four sides, the Stadtpark is besieged by heavy-traffic roads, the subway line U4 goes straight through the middle of it - and so I haven′t found a single spot where one could sit without hearing the traffic. Back in the 19th century, this biggest park in central Vienna (65,000 square metres) was a fancy meeting spot for the city′s aristocracy. The park was built under the rule of mayor Andreas Zelinka and designed in the style of an English landscape-park by Joseph Selleny. It was opened in 1862. The so-called "Kinderpark" ("Children′s Park") was built one year later. Apart from the Strauss memorial, the river banks and their Jugendstil (Art Nouveau) ornaments are among the main attractions of the Stadtpark: They were built between 1903 and 1907. In the Strauss memorial itself is in my opinion the most distasteful memorial in all of Vienna, even worse than the already pretty heavy Mozart-memorial at the Hofburg. It was created by Edmund Heller in 1921; the gilding was removed in 1935 and replaced only in 1991. On old postcards, you can sometimes still spot the un-gilded Strauss. Now more on the central building of the Stadtpark, the Kursalon Hübner: In the second half of the 19th century, "taking the cure" became a very fashionable thing to do. This followed certain light-hearted rules and developed a distinct culture, in which medical reason usually played only a minor role. Famous spa towns were Bad Gastein, Bad Ischl or Baden bei Wien. The Emperor Franz Joseph I was very fond of Bad Ischl, having been conceived there himself. He spent his annual vacation in the Salzkammergut spa town. In 1862, he ordered the construction of a Kursalon or spa pavilion. The current Kursalon Hübner was built between 1865 and 1867, it was designed by Johann Garben in the style of the Italian Renaissance - a masterpiece of historicist ugliness. Officially, it served as a venue where visitors could drink mineral waters - social events were prohibited in the beginning; but in fact, it was a place where the aristocracy would meet and mingle and soon, the ban of fun started to be ignored. The Kursalon Hübner served as a venue for concerts and public dances ever since 1868. Instantly, the Kursalon Hübner was Vienna′s most fashionable and trendy place to go out. In 1908, a Hans Hübner rented the Kursalon and gave his name to it: Kursalon Hübner. Unimpressed from the change of names it remained to be a fashionable venue, unharmed by two World Wars. In 1990, the city of Vienna sold the Kursalon Hübner - which is now owned by the Hübner family. It was refurbished a few years ago and is now a popular venue for balls, receptions and corporate parties. There are four halls on two floors in the Kursalon Hübner, a 1,000 square metre large terrace and nightly concerts that are pimped - among others - by street sellers. The concerts are popular mostly with tourists: There are approximately 500 a year with around 200,000 visitors. Attractions nearby are numerous - the Museum of Applied Art MAK, the Münze Österreich, the Akademisches Gymnasium, the Konzerthaus and Akademietheater, the area of Schwarzenbergplatz are in walking distance. 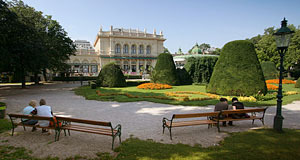 Thus, the Stadtpark is convenient for a short break on a sightseeing tour.